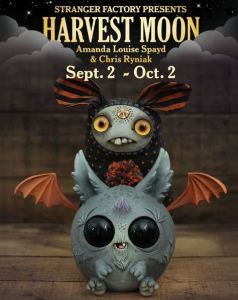 Stranger Factory is pleased to announce contemporary character artists, Chris Ryniak and Amanda Louise Spayd will be joining forces once again for their fifth collaborative Stranger Factory show, entitled “Harvest Moon.” Drawing from a mutual fondness of Halloween, the two have crafted a show that celebrates crunchy fallen leaves, crisp autumn air, and the spooky darkness of a moonless night. Chris’s detailed sculpting brings iconic characters into his own signature style. Friendly pumpkins, black cats, bats, and other creatures of the night will come out to play. 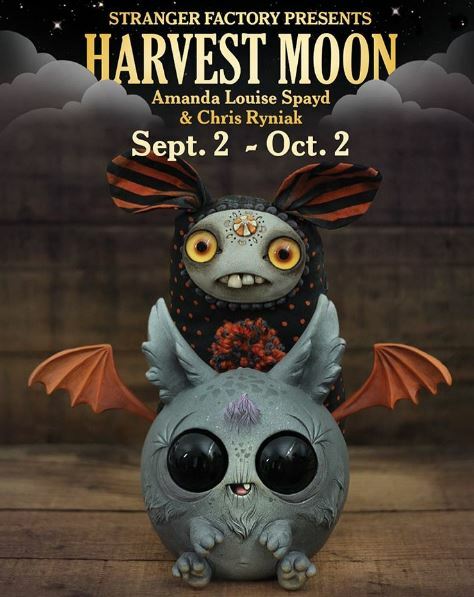 Amanda’s vintage-inspired Dust Bunnies recall a nostalgic Halloween from days gone by. Festooned with garlands, Trick-or-Treat bags, witch hats, and other festive touches, they eagerly await the witching hour with wide-eyed wonder. Amanda Louise Spayd’s mixed-media work combines the textures and colors of antique domestic objects, the natural world, and an obsessive attention to detail. Her aesthetic is influenced by her love of antiques and textiles, as well as a deep nostalgia for the innocent curiosity and emotional attachments of childhood. Creating objects that evoke strong emotions – pity, love, or a feeling of protection over them – is at the core of what inspires her artistically. She has been published internationally, and is highly sought after by collectors around the globe, as well as having recently entered the toy market with both Japanese sofubi and vinyl blindbox toys, as well as cast-resin collectible figures. Chris Ryniak is an American artist born in the suburbs of Detroit, Michigan. He spent his childhood basking in the warm glow of Saturday morning cartoons and flipping over rocks in search of insects, reptiles and ghosts. A sculptor and painter of all manner of creatures both large and small, he has exhibited in galleries and museums throughout the world. His work has also been published in numerous books and periodicals in the US as well as in Europe and Asia. Chris is a toy-designer and sculptor of numerous instantly sold-out editions of designer art toys and figures. He is also well-known for his series of daily monster drawing project entitled ” Morning Scribbles” in which he has created and shared over 800 original creatures. The show will run September 2 – October 2nd, 2016.